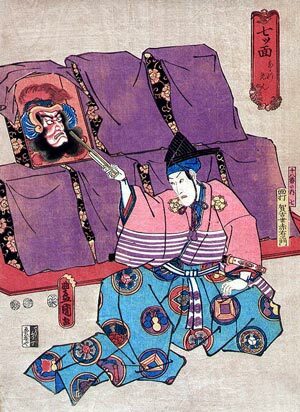 "Nanatsu Men", which literally means "Seven Masks", was staged for the first time in the 2nd lunar month of 1740 at the Ichimuraza, as the second part of the drama "Sugatami Sumidagawa", with Ichikawa Ebizô II playing the role of the mask-maker Gagoze Akaemon, in reality Awazu Rokurô Saemon. This first version was not entitled "Nanatsu Men", as Ichikawa Ebizô II used only 5 masks on stage. He revived the scene in the 7th lunar month of 1742 in Ôsaka at the Ônishi no Shibai, playing the role of mask-maker Gagoze Akaemon, in reality Akushichibyôe Kagekiyo, in a drama which was entitled "Hoshiai Sakae Kagekiyo" and used 7 masks. It received the title "Nanatsu Men" and quickly went into oblivion. It was revived by Ichikawa Danjûrô IX and the playwright Fukuchi Ôchi, who wrote a new version which was entitled "Shin Nanatsu Men" and was staged in November 1893 at the Kabukiza. The 1740 version of "Nanatsu Men" was revived by Ichikawa Sanshô V and the playwright Yamazaki Shikô in May 1936 at the Kabukiza [casting]. The 1742 version of "Nanatsu Men" was revived in January 1983 at the National Theatre, with a new script written by Tobe Ginsaku [casting]. The 1936 "Nanatsu Men" was made up of one act. The 1983 "Nanatsu Men" was made up of two acts. "Nanatsu Men" is about the Nô mask-maker Gagoze Akaemon, in reality Awazu Rokurô Saemon, who removes various masks from their boxes, dancing their parts. He discovers a stolen scroll hidden in the mouth of the last mask (the seventh one), the mask of an evil character. He gives back the precious scroll to its legitimate owner, Yoshida no Shôshô.